How do you even define self-care? I used to think it meant when I treated myself to a bar of chocolate and a few glasses of wine. Or indulge in a a piece of cake because I’d been “good” and “deserved it”. Rewards were often food-based for me as that’s how I’d grown up. A sweetie after taking horrible-tasting medicine. Another sweetie to take my mind off of my grazed knees if I’d fallen and hurt myself. Stodgy suet puddings every Saturday at my Nan’s. Decadent desserts on Sundays after a traditional roast dinner with my family. But food or drink as a reward, a treat, a form of “self-care” gave me a high of a few minutes (probably while the food or drink was still in my mouth or the sugar was still whizzing around my system). And then a much bigger low of either guilt, a downer after the sugar rush or a hangover. I was also brought up on shopping being categorised as a past-time. Go and buy yourself some clothes and you’ll feel much better! Mooch around the shops and “get something”. That usually ended in disaster – clothes I didn’t wear and a diminished bank balance to boot. I was also brought up on watching hours of TV every evening to relax at the end of the day. But watching the news or an action film just before you go to bed is a recipe for sub-zero sleep quality and excessive worry. It wasn’t until a few years ago that I started wondering if food and drink-based treats, shopping and mindless screen time were a good idea. Aren’t there other, more effective ways of making me feel good? I’d discovered journalling 20 years ago when I started my self-discovery journey. Susan Jeffers suggests creating a “Book of Abundance” in her most amazing and life-changing book, Feel The Fear And Do It Anyway. When I get into bed, I take the notebook and pen on my bedside table and write down a little list of three things I’m grateful for that day. A couple of years ago, I started adding three items of self-praise – things that I’d done well that day or had achieved. This ritual calms me down after a crazy day. It’s a good transition for my eyes and brain from the laptop/TV/smartphone. And before I lie down to sleep, it gets me focused on the what I have (gratitude) and have achieved (self-praise). Instead of what I don’t have (lack) and still have on my to-do list (self-criticism). Self-hypnosis has been part of my daily self-care for the past few years too. I used to listen to generic CDs and I had some good results from them. However, since becoming a hypnotherapist myself, I know how to really get down to the root of an issue. This has been life-transforming! Once I’ve worked out what has been holding me back, I write myself a hypnotic programming script, record it and listen to it once a day. I take a short 15-20 minute break in the afternoon after my youngest son has arrived home, we’ve had lunch and I’ve been out with our dog. 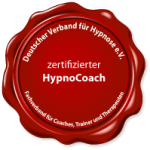 Listening to a hypnosis audio a great energiser, brilliant self-care and a fab way to transition from one part of the day to the next. There are a number of other tools I use sporadically, like EFT (tapping), forgiveness and meditation. A recent addition is angel card readings which can point me in a new direction if I’m stuck. And of course, getting out in the fresh air is a great self-care tool. I do it twice a day when I go out with our dog, Bonito, and two to three times a week when I go running. We also try to go for a longer walk on a Sunday in the forests around the city we live in. Recently, though, I’ve been neglecting even basic self-care. There have been so many new things going on in my life, I’ve had wall-to-wall appointments and a to-do list as long as my arm. Yesterday I hit a low and was feeling the negative consequences particularly badly. First of all, I reached out to some friends and they helped me pick myself up again. I’d recently started running again so I knew that would be helping. I asked my angel cards for help and I pulled three very appropriate cards that have given me a new perspective. And I committed to a new, simpler morning routine of a 10-minute meditation and 15 minutes of reading/listening to an (audio)book. I’ve also recommitted to my evening self-care ritual of writing my gratitude and self-praise journal. I add other tools if time and sleepiness allow. And for an extra dose of self-care and thinking time, I’ve scheduled a morning at the local thermal baths and sauna. So I’ve learnt my lesson to make self-care non-negotiable even if my life is crazy. And I urge you to either start a self-care ritual of ONE THING a day that really nourishes you. Make sure it doesn’t involve shopping / food / drink / screens / anything else that doesn’t give you a natural high. Or to commit to your current self-care ritual and do it no matter what crazy things are going on. 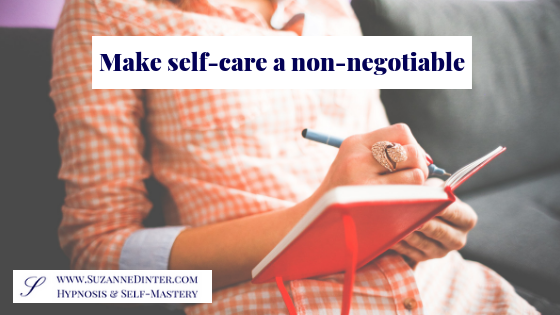 Make self-care non-negotiable in your life. You’ll thank yourself for it and reap the benefits for years to come. So now over to you: what do you do for self-care that nourishes you? Is it a non-negotiable in your life? Let me know in the comments. Great post as always Suzanne with some excellent advice. It’s also reassuring to see you ‘slide off the self-care track’ and how you recognised that you needed to get back on track. For me exercise is a big part of my self-care – my gym classes and PT sessions are pretty much non-negotiable. Enjoying nature and spending time with the dogs (while not always guaranteed self-care – all dog owners will recognise this I’m sure!) is key to my well-being. Thanks, Carol! Yes, I frequently tell myself that household chores can wait, LOL!